“We believe that Msgr. 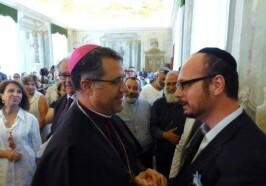 Lorefice’s gesture is unprecedented in the history of the reconciliation between Jews and Catholics,” says IRWF head. The International Raoul Wallenberg Foundation will honor Archbishop of Palermo Corrado Lorefice with the Raoul Wallenberg Medal for making the revival of an ancient Jewish synagogue in Sicily possible, the organization told The Jerusalem Post on Tuesday. The foundation learned of Lorefice’s contribution to the Jewish community in the Sicilian capital after the Post reported on a ceremony held in January to celebrate the opening of Palermo’s first synagogue since the Spanish Inquisition. At the ceremony, Lorefice officially transferred to the Jewish community a facility owned by the church and monastery of St. Nicolo Tolentino, which was built atop the ruins of the Great Synagogue of Palermo. The transfer was made upon the request of the Jerusalem-based nonprofit Shavei Israel and the affiliated Sicilian Institute of Jewish Studies, which had lobbied the church for over five years to help revive the once-vibrant Jewish community. Having taken an interest in the story, the IRWF – an interfaith NGO devoted to underscoring inter-confessional dialogue – decided to honor the archbishop as a token of appreciation for his gesture. “We believe that Msgr. Lorefice’s gesture is unprecedented in the history of the reconciliation between Jews and Catholics, following the legacy of Angelo Roncalli [Pope John XXIII],” Danny Rainer, head of the foundation’s Jerusalem office, told the Post. Most of Sicily’s Jews fled the Italian island in 1493, expelled at the order of Queen Isabella I of Castile and King Ferdinand of Aragon. A small number of Sicilian Jews who were not expelled underwent forced conversions and remained in their native country. According to Shavei Israel – which is active around the world in communities of Bnei Anousim (forcibly converted Jews) – growing numbers of Sicilians are now rediscovering their Jewish roots. Rainer emphasized that the foundation focuses on rescuers, and while this is usually construed as applying to saviors of innocent people such as Raoul Wallenberg, who rescued thousands of Jews during the Holocaust, it also includes those who have rescued cultural, ethnic and religious symbols. Rainer said Lorefice had “agreed with joy” to accept the award. The ceremony is due to take place in Palermo, later this year, in the attendance of a special delegation of the foundation that will fly to Sicily to present the medal to Msgr. Lorefice. The NGO also plans to invite religious and community leaders from all denominations, as well as politicians and other distinguished personalities from various walks of life.